German Federal Chancellor Angela Merkel has explained her position regarding the extension of EU sanctions on Russia. 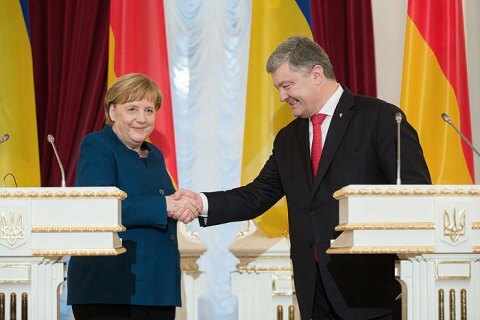 "Germany will stand for the extension of sanctions," Merkel said at a joint briefing with Ukrainian President Petro Poroshenko after their meeting in Kyiv on Thursday. Yet, the German chancellor said the sanctions could be relaxed if there was progress in resolving the situation in Donbas. "It has been said at the press conference that the Minsk agreements are not being fulfilled. If something [positive] happens, it is only a millimeter. There is a rollback from time to time... Unfortunately, there is no stable truce and soldiers are dying. We need to intensify the [ceasefire] efforts," Merkel said.